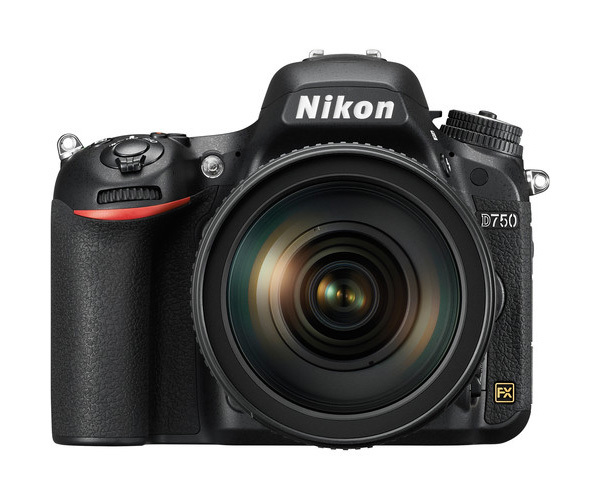 The Nikon D750 (B&H / Amazon), was one of Nikon’s most anticipated cameras, as so many photographers were waiting for an update to their beloved D700 cameras. 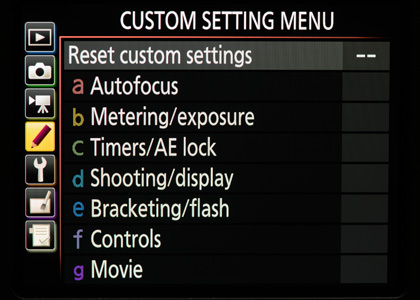 And like you’d expect from a top-end camera, it has a huge range of customizable settings. These make the Nikon D750 a camera which can be configured in a highly personal way, depending on your shooting style and needs. Going through the menu, the options might be overwhelming. Many of them can be left to the default. Some settings will clearly user preference. But with some settings, a change in the function of a button or dial can make a big difference in how the camera responds. Here is an overview of my preferences for the D750, and the settings that I changed immediately upon getting the camera out of the box. This isn’t a thorough listing of every item in all the menus – that’s what you have a manual for. Instead, this is a quick overview of the settings I’d recommend. All of this of course only touches on the options available with this camera! An interesting note is that there is a new addition to the menus. 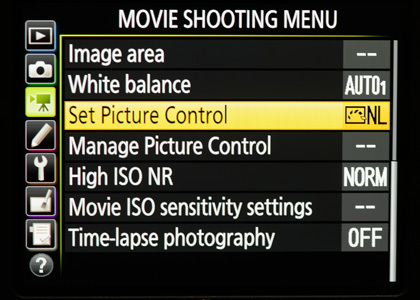 The Shooting Menu has now been split into two: Photo Shooting Menu, and the Movie Shooting Menu. This makes sense since it’s become quite prevalent that some photographers would use a DSLR as predominantly a video camera. So that menu needs to be directly accessible. 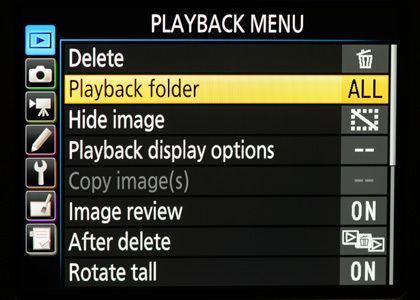 I keep PlayBack Folder set to All. Then I can see all the images on my camera, instead of just one folder. This will save you from the occasional heart attack when you scroll through images and think some are missing, when they are just in another folder. I also like Image Review to be On. This depends on where you are shooting though. 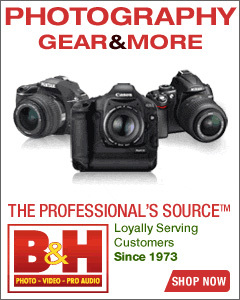 Photographers that work in low light and need to be surreptitious, might want to keep this to Off. 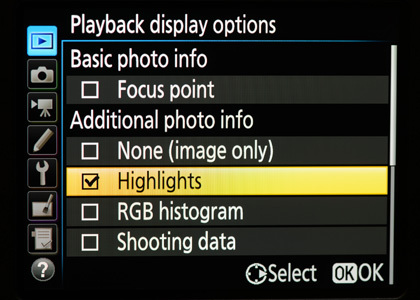 It is absolutely essential to have the Highlights enabled as part of an exposure metering method. The rest of the options really are optional. Too many photographers keep everything checked, and then have to scroll through too many screens to get to the essential one – the high-lights. With Continue as Before, the direction that you delete in, will follow your direction in viewing the images. This makes more sense to me than the other two options which might annoyingly skip to a direction of flow that wasn’t what you were viewing the images in. File Naming: It makes post-production workflow simpler if your images already have a unique name directly out of the camera. So I change it away from the generic DSC file name. 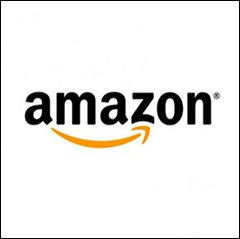 You bought a camera with dual card slots, so use it for what is the best option: Back-Up in case of card failure. 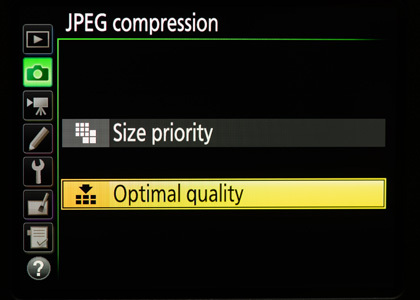 If you’re going to insist on shooting JPGs, then at least turn it Optimal Quality for less compression and better image quality. 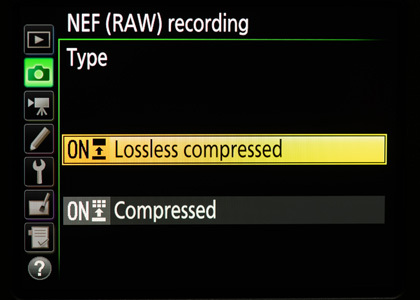 Lossless compressed RAW seems like the best of both worlds – the power and flexibility of a RAW file, but not too large. If you shoot JPG, then Active-D lighting makes sense. If you’re shooting RAW, then it has no effect on your image. 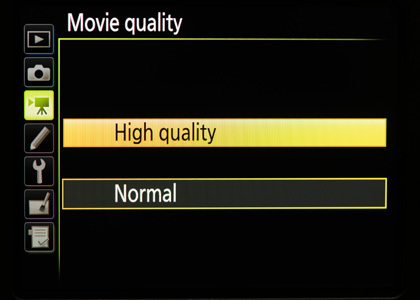 I really like that the Movie Shooting Menu is now immediately available. Now everything is less deep inside the menu. If you want to be able to slow the video down, then 60 frames a second will give you a smoother look when you bring it down to 30 fps in post-production. 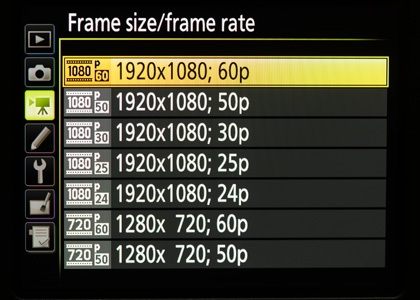 30 fps is the standard frame rate for video broadcasting the USA and other region 1 countries. 25 fps is the standard for PAL / region 2. 24fps if you want a more cinematic feel. For all of these, make sure you do some research on the 180 degree rule to understand which shutter speed settings are preferred. Personally, I’d go for the Higher Quality video with less compression. But it would depend on your final use of the video material. Clips meant only for Youtube won’t benefit from the better quality. 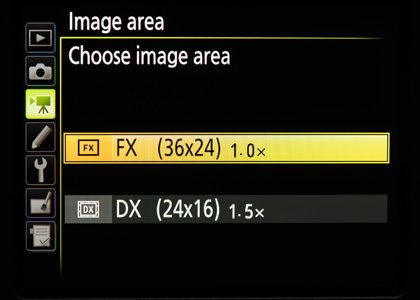 An easy way to get a different “focal length” is to flip between FX and DX. With the DX crop, you get a tighter framing. Very neat for when you can’t zoom in or move closer. If you shoot video, you might prefer a more flat video if you’re going to edit it later on. Remember, it is easier to add Contrast and Saturation than remove it. This is why I keep this Picture Control to neutral. We’ll cover this in more detail a few hops below. 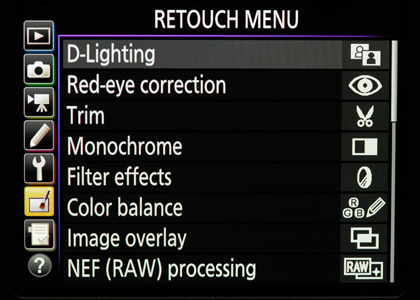 The Retouch Menu allows you to do in-camera processing. 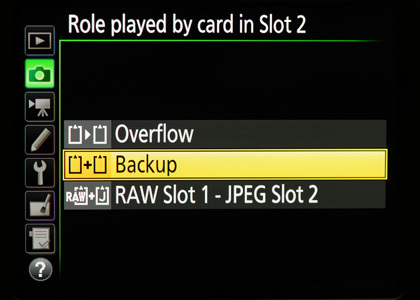 There might be uses for this – adjusting Color Balance in-camera, or any of the options available with RAW processing. The more interesting effect here is the Image Overlay. You can combine two images, and adjust their individual brightness levels, which affects the way the images are overlaid. 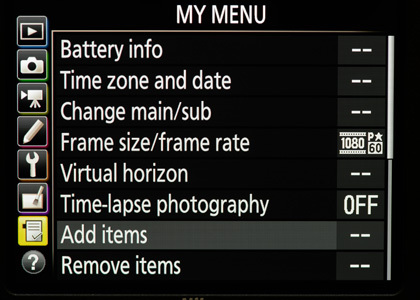 This is a menu I rely on heavily with all my Nikon cameras – quick access to the functions you use most often. I have the Pv button (depth-of-field preview) programmed to bring it up immediately for me. Here are the ones I prefer having immediate access to, such as battery info and the virtual horizon. Oh, I have the “Change Main/Sub” option available. I like the aperture dial to be on the back, and the shutter dial on the front. But when I hand my camera to another Nikon user, I can quickly switch it back to behave like a regular Nikon camera. With the Custom Settings Menu you can access all the options which can make the camera a highly individual one, adapted to your style of photography. I prefer the camera not to go to sleep in the short period of just 6 seconds, which is the default. It feels like you can barely look away with the camera’s metering turning off. 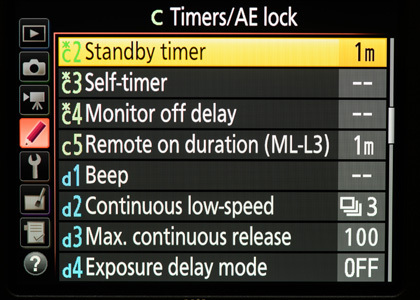 I therefore change the Standby Timer to a more generous setting. 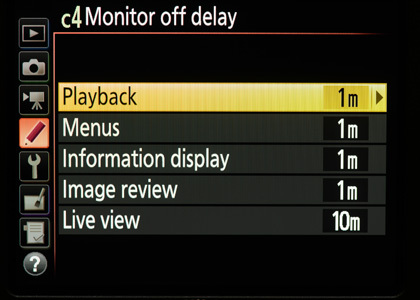 Really, the options for the Monitor Off Delay can be bumped up considerably for Playback and Menus and Information display. It is quite annoying when showing someone the LCD and it dips to black so quickly. The Nikon D750 battery (EN-EL15) was designed to last longer than any Nikon battery before. Besides, you have s pare with you anyway. The LCD preview doesn’t eat as much power as Live View, so it can be set to display longer without affecting your camera’s power much. 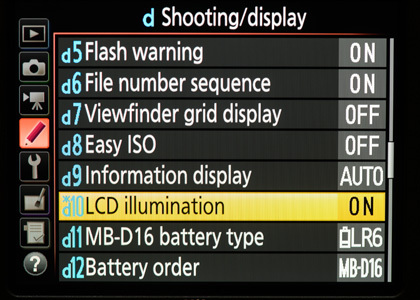 LCD Illumination – I love this feature, especially on the D3 / D4 range of bodies. Set it to ON. Then every time you touch any button, the info panel comes alive and lights up. 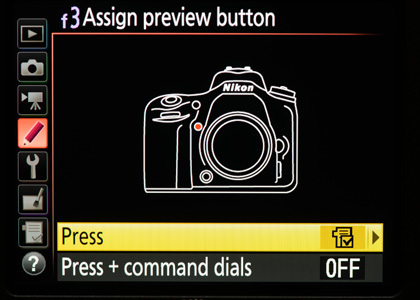 On the D3 / D4 range of bodies, the camera buttons gently light up. Makes it so much easier to see your controls in the dark. 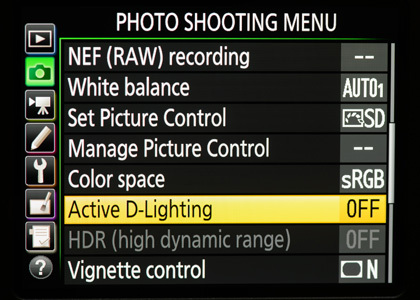 This setting has less impact on the D750 though. Set the flash to 1/200 Auto FP. Or to 1/250 Auto FP. The difference between the two settings should be marginal if I go by previous tests: Auto FP flash setting for Nikon D300s & D700. For me, this is a setting that makes a huge difference in the handling of the camera. The OK Button can be changed away from the default of showing thumbnails (which isn’t useful to me), to the Enlarged view when in Playback. Seeing the image at 100% to check for sharpness, is essential. So instead of progressively zooming in, you can now just tap the OK Button, and instantly have a 100% view of the image! I like being able to disable the flash instantly from the camera with a single push of a button. Assign the F’n Button for this. For me, a very useful ability. You might have another need for the F’n Button. It’s there, so use it! Since I use My Menu often, I Assign the Preview Button to instantly bring up my most used camera functions via My Menu. Again, this might be a function you have your own needs for. It’s there. 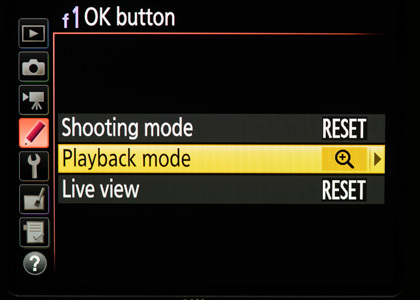 You can Assign the Movie Record Button to do another function when in Photo mode (as opposed to Video mode). I like having the ISO immediately accessible from the top plate, similar to the Shutter Speed and Aperture. You can also change this button to change the White Balance. When in Video mode, this button will act the record button that it is. 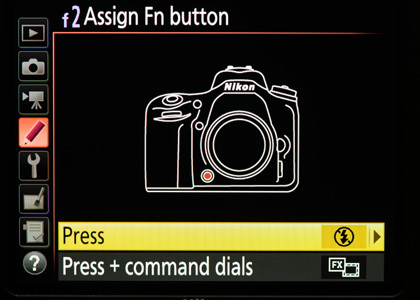 The older Nikon bodies had the quirk of having the metering display with (+) to the left of the zero. Completely in contradiction to everything you’ve been taught in mathematics. 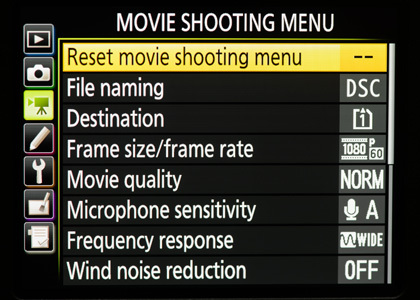 So with the D750, (and other recent models), it has now been sensibly changed to read the correct way as a default. Don’t change it! I suspect the original (+ zero -) display was done so that the dials had to be rotated in the direction shown in the metering display. Still, it was visually confusing, and I am glad they changed it. These are my preferences and suggestions, not meant as autocratic must-do instructions. Let us know how you prefer having your camera set up. as for “Assign the F’n Button” – I have a question. for example you are in church and you set your camera without flash – ISO 1600, f/2,8 1/100. couple of photos and then you whant to turn the flash on. so your settings are – ISO 800, f/2,8 1/200 – another couple of phots and then you whant to turn the flash off again. 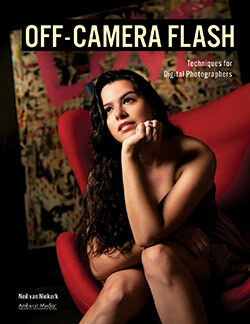 I also use the function button to disable the flash on my D700. I find it useful to allow a quick comparison of ambient versus ambient and flash to see how much light I am adding. Two quick shots tells everything. Additionally I set the preview button to spot metering. I generally stay in matrix metering but using your wedding dress metering method (with spot rather than zooming in to fill the frame) is as easy as a quick button press and dial it in. 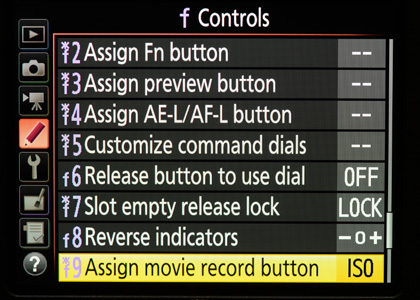 I wanted to check if the ae/af button can be customized to back button focusing? Key to this is whether it will activate VR? 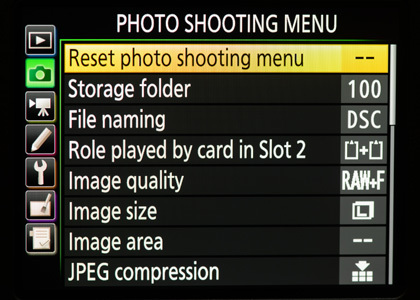 I know it did not on the D700 but hopefully they’ve added this function. One thing I found confusing on my D610 which may be on the D750. There’s a flash setting buried somewhere that makes EV only affect ambient and not flash. This is opposite to everything before where EV affects both ambient and flash. Not sure what the default is, but somehow it was switched on in my D610 and then I couldn’t control my flash levels and was getting very confused! It is Custom Function E4 that you need to play with. Hi, Unfortunately I only have the use of one hand (left one) and it would be ideal for me to use a different button to change from AF-S to AF-C to AF-A (I never usually use AF-A). At present it is as far away from the main wheel as they could get it, lol. it would be ideal to be able to use the AE-L, any ideas any one. Hi, I like the controls setting f6, you can then alter values using the dials without holding the corresponding feature button, seems to make life a little simpler. Thank you. That is such a needed article! My comment and query is long. Please bear with it and I would deeply appreciate a reply. I had a curious problem and google brought me to you inadvertently. I had the camera switching back from RAW to JPEG even without my touching the menu button, never mind actually going into the relevant option. I suspected it might be the inadvertent default settings of one or a combination of the other buttons. And I need to solve this because my special trip to Namibia has landed me with zillions of jpeg images. Its pretty heartbreaking. I still am not certain – and would definitely like your advice on this particular problem! But is it likely that the mode dial had turned to U1 or U2? 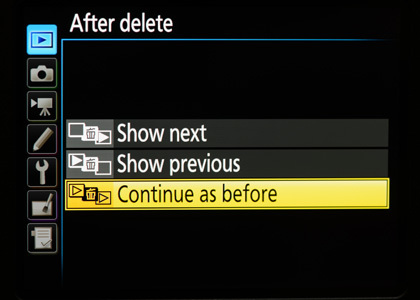 I noticed that the settings in these two modes were turning back to JPEG although in other modes its stayed at RAW. Reading your article and following some of the steps, I discovered that one can actually assign the current settings to U1 and U2. I have done that and now it looks like its fixed at RAW. BUT both U1 and U2 are completely identical. Help! And while I am sure you are not going to be the last to raise your eyebrows … I normally (read always!) shoot manual. I must admit that I would have preferred to have ALL the menu options covered in this article. 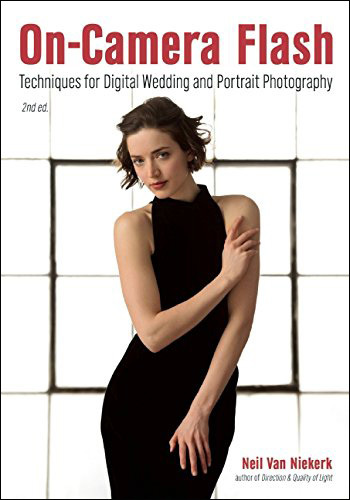 Its of immense help to those of us who are new to the whole science of photography. The menus are plain frightening in the number of options. As for all the abbreviations and technical terms, well … Yes, I know we need to read books and articles and finally the manuals of the bodies and lenses. But lets be real honest. How many of us do that – cover to cover – BEFORE launching out on an expedition? This is where articles like this really hit the spot! Not only do you give the information, you actually force us to scroll through those menu options at least once! It does seem the most logical explanation for what you experienced – you must have knocked your camera to the U1 or U2 settings. No real away around this than constantly be aware of your camera’s settings. I have the D750, and love it. I am new to photography and have a lot to learn. I could use some advice for outdoor portrait shots. My images aren’t crystal clear as I would expect from a camera of this caliber. Can you please suggest some settings? Thanks so much! 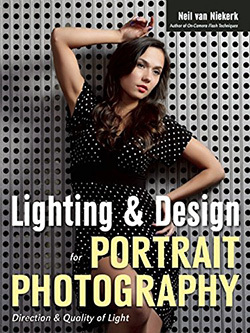 Try http://www.fullstopbooks.com/nikon-d750-experience/ its a great PDF that elaborates the use of Back Button focussing. Love my 750! I had previously read this article when I set my camera up a few months ago. Tonight, a problem and a Google search brought me back thanks to a comment below. 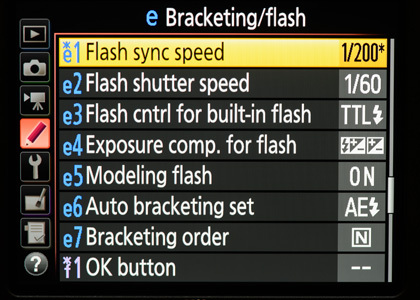 Coming from a d700… Confused with flash behaviuor in P mode. Chooses very small aperture and very high iso if iso auto is selected. Can somebody help? Question – what ISO setting where you anticipating the camera to give to you? With d700 it did not happen. I have no idea why the D700 and D750 would respond differently, but the one precaution you can take that the ISO doesn’t go too high, is to set “Maximum Sensitivity” under your “ISO Sensitivity Settings” in the Photo Shooting Menu. Alternately, go full Manual Exposure mode on your camera. I “accidentally” found your site this morning on a rabbit trail trying to find out why, after a photo shoot, I had no images on the SD card. Who knew there were different files/folders on the card. At least I hadn’t deleted by accident. Your settings showed me where to look. Thank you. How many single RAW pictures it can take on one charge? Very helpful, thanks! Just that one change (to reprogram the OK button to enlarge the preview) was worth it’s weight in gold! Easy to follow instructions, too! Possibly you can advise me with regarding the following problem. I just bought the Nikon D750 and after a week or two it automatically is overlaying all images. But all the images have different filenames. Did I inadvertently change a setting? Rob, I suspect you have Double Exposure enabled. and scroll down to Multiple Exposure, and see if that is enabled. The best you can do, is to meet up with a friend, and step through the menu simultaneously with the other camera’s proper menu. I have a Nikon D750 and when I am shooting in Manual after I have set everything up with the light meter I take the shot -which is fine but the camera then chabnges the shutter speed so that I cant take 2 pictures in a row. I suspect you have bracketing mode enabled. But as to why your camera would randomly refuse to take a photo – I don’t have enough info here to make an informed guess. Mark … Unfortunately I can’t give you an authoritative answer to that. Hopefully someone more knowledgeable can chime in. Are there any issues that may arise if I change the DSC file name to something else so th at I don’t have duplicate file names from phots that I have taken with my older Nikon camera? Nope, no issues – that’s why the feature is there – to help you. I give all my cameras slightly different names, which also helps immediately figuring out which camera I had shot a specific image with … but then I usually rename my images shortly after I ingest them onto the hard drive. I have an issue when using Manual Mode. I choose my settings, take the picture, but my camera changes my settings automatically, from what I have selected. It appears to change them when I slightly depress the shutter release, before the shot is captured. Any idea what is causing that? 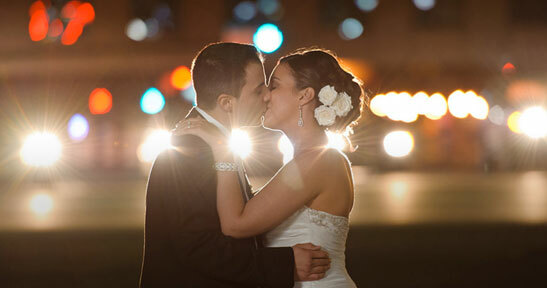 It is a bit frustrating in that it has caused a few shots (at a wedding, no less) to be either under or overexposed. What could I have done in my settings to make this happen? It sounds to me like you have bracketing set. Disable that, and I think your problem will be solved. Thanks for this tutorial first of all. I have a question about what the best way to handle exposure differences between lenses. That is, say I have U1 setup to handle exposure (and esp. shutter speed) for a 180 f2.8 lens. I want this to have say a minimum of 250th sec shutter speed. Now I change to a shorter lens like 24-85 zoom. I want to set this up for something like 1/100 sec for arguments sake. Is there a good/better way to handles this as I go from one lens to the next? It would be great if there was a some way to have a preset for each lens I own but I don’t see any way of doing that. Any suggestions would be welcome. Hi there Phil – I see what you’re attempting to do there – you want to have the “minimum hand-holdable shutter speed” programmed in for each lens. This is a dead-end though. For starters – the idea of a “minimum hand-holdable shutter speed” will most likely give you soft images because of camera shake. 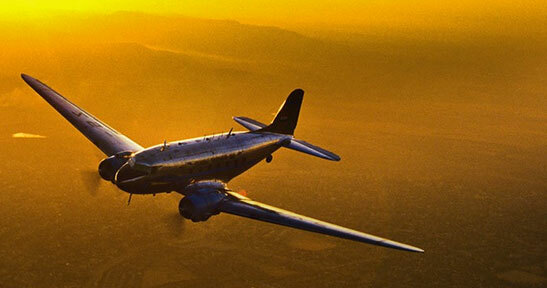 Read more here: Faster shutter speeds for sharper photos. I have Nikon D750. I am trying to do video shoot in Aperture mode, but problem is I can’t change neither ISO or shutterspeed. Camera is fixed with auto ISO & shutter speed, I can’t change it auto to manual. But If I am switching to picture mode, I am able to change auto to manual through front dial. Kedar .. you will have to adapt. Video is shot with manual settings. That is how it works. Somehow my D-750 was showing no images, so I knew what the problem was, but did not know which of the settings to change (“ALL”) to get around it. Interestingly, the images were in a folder I looked at, but could see none! Thanks! Wonder why? Love your setting to zoom into the image! You saved my button and thumb both! You are better off cropping it to this aspect ration in post-processing of the RAW file. But if you really need 16:9 directly out of the camera, switch the Live Preview to video, but instead of pressing the Record button, take a photo. You said you switched the main/sub dials via the control menu. How exactly did you do that? I’ve gone to that menu, but I can’t see where it’s available. Thank you! 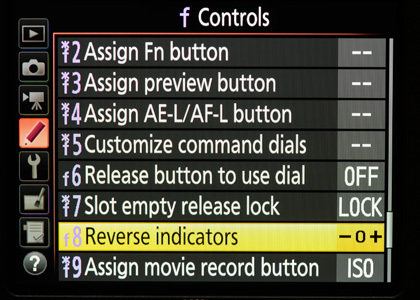 It is under Custom Function F5 – Customize Command Dials. I found that the D700 and the D750 colors are more radiant with the d700 than the D 750. Can someone tell me how to change the shooting colors in the D750. I recently bought Nikon D750 recently and I couldn’t find a wifi option in the menu and the network option also appears grey. Someone told me about K version of the camera. How to check if it is K version. This is the first that I have heard of the K version. Doing an internet search, it would appear that it is a version that is sold in some Asian countries. (Korea?). I see no mention of where they show it is a K version, other than labelling on the box. Your piece prompted me to do a thorough settings review, and in particular the (f) Controls settings. I’ve always changed the ISO (b1) and exposure (b2) increments to 1/2 stops since I find it so much easier to make rapid exposure adjustments without having to count through triplets of clicks and readings. 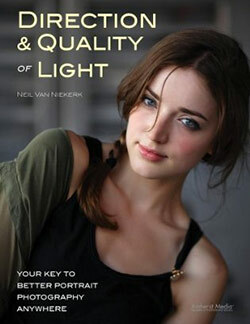 This likewise sets the flash and exposure compensation buttons to increments of +- 0.5 instead of 0.3 & 0.7. I might have valued thirds of a stop in the days of slide film but the RAW format has so much latitude, I find such precise control distracting and unnecessary. An unexpectedly useful control (f5) customisation is that I can revert aperture control back to the aperture ring on the lens. Why would I want do that? Well, when I got the D750 I found that the default command dial configuration – shutter front, aperture back – was completely counter-intuitive to me. It took me a while to learn I could switch them about but by that time I was already half-adapted. Whichever way they were configured, I’d still regularly move the wrong dial the wrong way! Also my forefinger can’t seem to leave the front dial alone and so I’d frequently find I’d shifted it unintentionally. My lenses’ aperture rings are now constrained to 1 stop increments but again I find this to be less a limitation and more a liberation in terms of speed and decisive choice of aperture. I feel no less creative for not having the subtleties between f5.6, f6,3, f7.1 and f8 – decision fatigue is a cumulative effect. Since there is already an ISO button on the back of the D750 I didn’t quite see the point of your customising the video/record button until I tried it. Now I get it! – with my current configuration I can adjust the shutter by up to two stops with my thumb, press the top button with the same hand and then compensate with 2 stops of ISO on the thumb’s return, just as swiftly as we used to advance a film frame! I guess this is the thing. My D750 is now configured to operate more or less the same as the old film cameras I grew up with. Maybe we forget quite how ergonomic ‘analog’ cameras simply were, before microprocessors presented us with levels of sophistication and control that perhaps intrude upon the creative process.